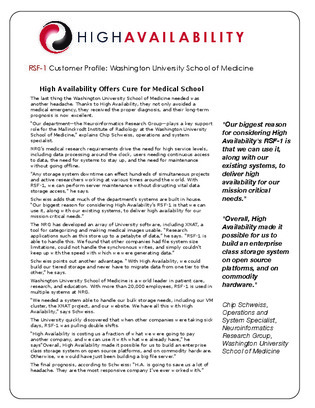 Not every system is built to handle bulk storage needs—a grave reality that the Washington University School of Medicine faced with their research apps generating petabytes of data. Theirs was a need for high service levels, accommodating data processing around the clock, and establishing continuous access for users—even during maintenance—which other file systems with size limitations could not fulfill. To accommodate these needs and provide high data availability in the event of downtime, the University employed the RSF-1 tool. To learn what it is and how it works, view the case study here.